Despite my interest in skincare, I'd never previously tried a sheet mask. Popular in Asia, sheet masks are, as the name suggests, sheets of fabric which are saturated with skincare ingredients and are placed onto the face as opposed to products being directly applied to skin. I was excited to try my first sheet mask from the brand Wei, which is a luxury line inspired by traditional Chinese medicine. There are a number of sheet masks in the range to suit different skin types, as well as eye treatment pads. Today's review is of the White Lotus Hydrating Treatment Pad. On first impressions, I was surprised at how saturated with product the sheet was. It almost had a jelly like texture and for this reason, I found unfolding the mask & applying to the face to be a little fiddly. You need to be careful not to rip the mask & I found out that it tears easily. I found the directions to be slightly unclear and I wasn't sure if there was one side which should be applied directly to the face. A search online provided descriptions explaining that there's a blue layer which should be applied away from the face then peeled off but mine didn't have this, which I found confusing. I liked that it's inherently hygienic by way of being a one-use product. The mask felt cooling on application which I liked as it had a soothing effect on my sensitive skin. The high moisture content helps the sheet mask to stick to the face so I could move around more than I had anticipated although you can't move your face very much- in this respect, it's similar to a clay mask that sets on the skin. With cut outs for the eyes and mouth, it certainly gives a strange, almost Halloween-like appearance whilst wearing the mask! Having said that, 10 minutes isn't a big commitment so it's easy to try out this mask. The mask had a very pleasant fruity fragrance. 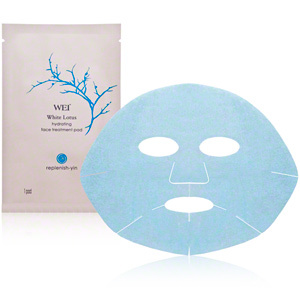 Wei White Lotus Hydrating Face Treatment Pad contains hyaluronic acid- which my dehydrated skin loves so I expected a positive result- along with lotus which is known to possess antioxidant and anti-inflammatory benefits. After 10 minutes, I removed the sheet. I felt as though there was wasted product by throwing away the still-damp treatment pad & quite a bit of product residue in the packet, which I'd recommend keeping and applying as a serum. My skin was left looking plumped and feeling wonderfully hydrated. I'd be interested in trying more sheet masks although I still prefer masks which are applied directly to the skin, not least because I didn't like that I wasn't treating my neck. At £55 for a packet of six pads, this is expensive and whilst I'm pleased to have tried it, I wouldn't repurchase at such a high price, however, if it was available as a serum, I'd be interested in purchasing. You can conjointly realize additional information on regrowth hair loss and solutions hair loss. may be a comprehensive resource to grasp concerning Hair loss Treatment, for more information click here face treatment for men.